This chapter explores the distinct contributions of qualitative wellbeing research in relation to quantitative research, and particularly concerning the many ways in which wellbeing phenomena are ‘cultural’. The core contribution of qualitative approaches has been to highlight a ‘constructivist’ perspective, depicting wellbeing not as a quantifiable essence but as a diverse, fluid, and elusive set of feelings and evaluations. These meanings emerge from interactions among people, and between them and cultural resources. Qualitative research is part of that construction process, not just a tool for extracting data. Its value may lie more in the process - facilitating important conversations and debates - than in particular findings. Shortly before the rapid rise of happiness studies, the human geographer Yi-fu Tuan wrote that ‘culture makes it possible for people to be pleased with themselves: that is in fact one of its principal functions’ (1986, p. 1). Since both society and culture are often blamed for many kinds of injustice and suffering, Tuan’s observation offers a crucial corrective to pathologism. But in what ways are people ‘pleased with themselves’. Pleased relative to what or whom? Based on what criteria or reasoning? How can we tell? And is this really a matter of ‘fact’ at all, let alone one generalisable across all cultures? Does Tuan’s elegant but seemingly ad hoc presentation of evidence warrant such confidence? Wellbeing research is now proliferating at an astonishing rate, becoming more multi-disciplinary, more multi-cultural, and more diverse in its methods and approaches. At the same time, general publics, administrators, employers, planners, and professional wellbeing promoters are engaging more explicitly than ever before in public discussions about wellbeing worldwide, increasingly blurring the divisions between scholarly research and public learning. At the same time, the kinds of clear and confident findings produced by quantitative wellbeing research are increasingly being complemented by a diversity of qualitative research approaches, most of which raise questions, stoke conversations, and provide impressions and vignettes rather than confident findings. This makes it both increasingly important and increasingly difficult to synthesise practicable lessons from wellbeing research around the world. All wellbeing scholarship is mainly based on qualitative enquiry, and all the disciplines involved - including psychology and economics which are now mainly known as ‘quantitative’ and ‘positivistic’ disciplines - were constituted from qualitative research. But wellbeing scholarship, like most forms of humanistic or anthropological study, has often sought public esteem as a ‘science’ by displaying signals of rigorous control, expert detachment, and reduction of the objects of study to numerical representations of reality. In late 20th century the rapid rise to prominence of happiness scholarship and positive psychology was almost entirely unconnected to the ‘qualitative revolution’ (Camic, Rhodes, Yardley, & Bamberg, 2003; Wertz, 2011) that was belatedly spreading through psychology. Nonetheless, qualitative enquiry also constitutes a socio-political and cultural movement (Wertz, 2011; p. 93). This movement has in common with happiness research a strong desire to promote empathy across cultural and bureaucratic divisions, empowering people to articulate their own views on their own wellbeing. Unfortunately, disciplines like sociology and anthropology with long histories of qualitative research remained until recently oblivious to the wellbeing revolution that was sweeping through psychology and economics (Thin, 2005; Veenhoven, 2006; Bartram, 2012). The same has been paradoxically true of ‘liberation psychology’, which has explored cultural diversity, qualitative research, and empowerment but from an entirely pathological perspective (Watkins & Shulman, 2008). In wellbeing research, sometimes the push towards scientific rigour and quantification have resulted in implausible pseudo-scientific claims concerning factual knowledge about elusive phenomena such as ‘meaning’ or ‘spirituality’ or ‘positivity’ that clearly aren’t matters of fact (Sink, 2000; Mathews & Izquierdo, 2008a, p. 9; and see e.g. the 2013 critique by Brown, Sokal, and Friedman of Fredrickson and Losada’s ‘positivity ratio’ paper, 2005). In quantitative wellbeing research, sophisticated and fine-grained statistical techniques are commonly based on extremely blunt labels and fragile distinctions, such as those between ‘affective’ and ‘cognitive’ wellbeing, or between ‘hedonic’ and ‘eudaimonic’ wellbeing for example (in real life, it isn’t actually possible to separate feelings from thoughts, or pleasures from evaluations). Scientism in wellbeing research has also led to the neglect or denigration of qualitative or participatory research. Insofar as expert-led approaches exclude citizens as active learners, the wellbeing research movement may be missing opportunities for scholars to promote wellbeing directly through inclusive collaboration (Gergen, Josselson, & Freeman, 2015). Happiness surveys, which have produced important new understanding and - perhaps more importantly - have captured the imaginations of publics and politicians worldwide, epitomise the quantitative or ‘positivistic’ approach. Just as economists have since the 1930s persuaded people to believe in ‘the economy’ as if it were a measurable thing, so quantitative happiness scholars are now persuading us to imagine happiness as measurable entity that ebbs and flows at national level. Qualitative researchers, by contrast, emphasise that it cannot be ‘scientific’ to apply more precision or control than the subject-matter warrants. Their main contribution to the rapid growth and popularisation of wellbeing scholarship has been to strengthen recognition of both the potential but also the limits of systematic enquiry into ultimately elusive and partly ineffable experiences. A related contribution has been the ‘cultural turn’, highlighting the many uncertainties about wellbeing that derive from its dependence on culturally diverse forms of expression. Qualitative research de-emphasises the question of ‘how happy’ people say they are, and instead explores how people are happy, and how people think about and pursue happiness (Kavedžija & Walker, 2017). It invites respondents to consider their own explanations and experiences of various aspects of wellbeing, rather than extracting from them the inevitably artificial and simplified answers that survey questions elicit. Institutionalised downplaying or denigration of qualitative enquiry has been one of the most disappointing aspects of happiness scholarship and positive psychology so far (Rich, 2017; Hefferon & Boniwell, 2011; Gergen, Josselson, & Freeman, 2015). Lack of systematic attention to qualitative dimensions of research is all the more surprising because wellbeing is primarily a qualitative and a cultural concept. It signals evaluation and appreciation of how well people live. Most of the qualities implied are cultural (they are conceived, produced, expressed, and expressed through culturally patterned terms and idioms), interactive (they are produced and understood through interactions among people, not just by and through individuals), contextually intertwined (inseparable from their physical and cultural lifeworlds) and processual (they are dynamic, constantly changing as we observe and comment on them). When we judge ourselves or someone else to be living well, we invoke cultural values and scripts, we discuss those with other people, and those discussions influence the experience of wellbeing. Qualitative enquiry into wellbeing mimics and intensifies the enquiries that all humans do everywhere. The near-synonym ‘quality of life’ makes this qualitative assessment explicit: we want to know what life is like for people, not just how long they live or how ‘high’ they would rate their temporary feelings or self-evaluations. Surprisingly, however, most research on wellbeing or quality of life has emphasised quantification, sometimes at the expense of robust qualitative analysis. Some statistics are relevant to this appraisal in relatively unproblematic ways - longevity, morbidity rates, suicide and murder rates, for example. Other statistics, such as those relating to happiness, cultural values, and poverty, are useful but endlessly debatable. To appreciate their relevance and validity in wellbeing assessment, we need richly qualitative investigations and analyses. Unlike concepts such as ‘longevity’, ‘morbidity’, and ‘living standards’, which imply quantitative and factual comparisons, both wellbeing and ‘quality of life’ imply mainly qualitative assessment. The elusive, qualitative nature of wellbeing scholarship becomes particularly clear when we focus on happiness. This term, for which the more scholarly term ‘Subjective Well-being’ (SWB) is a synonym, refers to ‘subjective’ or ‘inside-out’ appreciation of life as a whole. In research on wellbeing, the more emphasis there is on a) subjectivity and b) interactions between personal and collective wellbeing, the more elusive and provisional our findings become. Qualitative approaches are crucial because many important features of the things being assessed (opinions, self-evaluations, self-expressions) are highly uncertain and subject to interactive and situational variation. Scientism: most of the journals specialising in wellbeing have mainly published work by scholars working mainly within ‘positivist,’ experimental, and/or quantificatory traditions that privilege facts and numbers over more ‘humanistic’ or ‘interpretivist’ approaches emphasising qualitative exploration and analysis (Michalos, 2004; Thin, 2014). Arguably, this has produced a research tradition that steers our attention towards indicators (e.g. national ‘levels’ of self-reported happiness) rather than the phenomena themselves (the experienced qualities of people’s lives). Western ethnocentrism: the subjects of wellbeing research have been disproportionately from wealthier and particularly ‘western’ populations, with consequent risks of cultural bias (Christopher, 1999); it remains worryingly common for North American or British researchers to use the phrase ‘our culture’ on the assumption that all their readers are culturally homogeneous. Oversimplification of crosscultural contrasts: insofar as researchers have tried to diversify the cultural backgrounds of research subjects, too much of the crosscultural research has been based on two naïve assumptions: that regional and international comparisons are the most interesting and important forms of cultural contrast; and that such comparisons can be well represented by surveying student populations (Oyserman, Sorensen, Reber, & Chen, 2009; Mathews, 2012; Tsai & Park, 2014). Qualitative pathologism: insofar as qualitative researchers have explicitly addressed wellbeing themes, they have predominantly done so through a pathological lens. Even the texts they have labelled ‘wellbeing’ have tended to be mainly about illbeing (Thin, 2005, 2018). Although these shortcomings are important and problematic, this chapter will demonstrate that many able researchers have successfully adopted qualitative and approaches to exploring interactions between culture and wellbeing. It is also true, although not explored here in any detail, that many primarily ‘quantitative’ researchers have drawn significant inspiration from qualitative research, and have done a great deal to bridge the unhelpful ‘qual-quant’ cultural divide. There are two different senses in which wellbeing research can be ‘qualitative’. First, all wellbeing research is ‘qualitative’ insofar as it relies heavily on careful consideration of the many qualities involved in wellbeing assessment and of the interactions between them. For example, ‘good’ emotional quality might mean excitement or calm, or it might be about relations between contrasting emotions through the day or through the life course. Even so-called ‘quantitative’ researchers in practice put their most significant efforts into qualitative thinking, and many confess that even the most sophisticated quantitative methods are more art than science. It is therefore extremely unhelpful to take sides in the so-called ‘paradigm wars’ between quantitative and qualitative research, or to draw a stark division between ‘qualitative’ and ‘quantitative’ research. Careful scholars instead consider a variety of qualitative aspects of all wellbeing research. Second, the term ‘qualitative approaches’ more typically refers residually to those scholars who don’t emphasise tight scientific control or the use of numbers in their pursuit of wisdom. Methods and analytical approaches used by scholars working with the ‘qualitative’ tradition are extremely diverse, emphasising for example interpretation, personal experience, debate, linguistic analysis, everyday in situ observation, and story-telling as the routes to knowledge. This chapter follows mainly this second way of thinking, on the understanding that other chapters here have much to say about qualitative aspects of more controlled ‘scientific’ research on wellbeing. Although we should appreciate the many values of qualitative research, it is also important to be aware of its limitations. For example, narratives and opinions can be biased, and in-depth qualitative interactions such as open-ended interviews and focus groups tend to reach very small samples compared to the representative samples reached by structured questionnaire surveys. And the kinds of ‘findings’ revealed through qualitative analysis tend to be much less clear and confident than the factual findings from experiments and statistical analyses. In addition, insofar as there remain significant gender differences in methodological preference, both quantitative (‘masculine’) and qualitative (‘feminine’) research traditions are prone to different kinds of gender bias (Oakley, 2000; Järviluoma, Moisala, & Vilkko, 2004). Few anthropologists, even those trying to promote public use of their work, even pause to discuss whether their assertions are ‘evidence-based’ (Liebow et al., 2013). ‘Method,’ for anthropologists, amounts to being reasonably thorough and multidisciplinary in doing secondary research; being a good listener and being interactive and observant during fieldwork; and writing up in honest and humanistic ways that bring real lives and cultural diversities to the fore. While considerable gains can be made from so much flexibility and reliance on individuals’ common sense, this makes it extremely hard to judge the quality of research design, the thoroughness and rationale of secondary research, and the quality of data and validity of interpretations. Everything humans do is cultural, and all research on wellbeing is ‘qualitative’ insofar as it is based on observations and analysis of qualities. We will focus here on the distinctive contributions of research labelled as both ‘qualitative’ and ‘cultural’. Although in theory this might apply to all research, in practice research is called ‘qualitative’ when it doesn’t make substantial use of either quantification or positivistic experimental hypothesis-testing, and it is labelled ‘cultural’ when it pays explicit heed to patterned and shared learning associated with a distinct population or activity. ‘Qualitative’ research tends to emphasise exploration and interpretation rather than positive proof, and to employ methods such as participant observation, discursive interviews, life narratives, secondary data analysis, and focus groups. ‘Cultural’ research may be about one particular cultural context (e.g. a North American school, a Korean business, and African Church), or a religion, or an Internet space, or a community or nation. Or it may be about broad crosscultural comparisons, such as Asia versus Europe. This chapter will also focus on ‘happiness’, used here as a flexible term for the subjective experience and evaluative interpretation of wellbeing. Though nowadays mainly associated with personal enjoyment and positive self-evaluation, happiness does still retain broader meanings that were more emphasised in the past, including the goodness and admirability of a person’s whole life. It is in common usage a synonym for ‘subjective wellbeing’, though it can also quite reasonably serve as an extended synonym for ‘quality of life’ and for ‘wellbeing’. 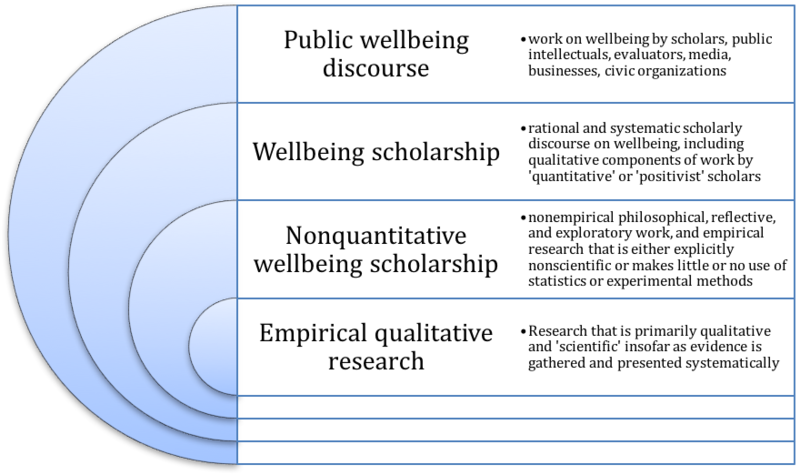 Figure 1 provides a thumbnail sketch situating the main focus of this chapter - empirical qualitative research on wellbeing - within the broader encompassing categories of nonquantitative wellbeing scholarship, wellbeing scholarship in general (all of which is mainly based on a substantial degree of ‘qualitative’ inquiry, analysis and theorising), and the broader public discourse on wellbeing (whose boundary with ‘academic research’ is often blurred). Qualitative approaches are a residual academic category that is in various ways contrasted with the kinds of approach that emphasise hypothesis-testing and scientific rigour through either experimental or survey-based quantification. These are loose categories and many researchers would be unhappy to be assigned to one camp or another. Even those who have some sympathy with seemingly anti-scientific attitudes of the ‘postmodernist’ movement and who emphasise interpretive or narrative approaches also consider their research to be empirical, and think of themselves as scientific realists. Biological wellbeing - health and longevity - can be fairly adequately represented as facts and captured in statistics. Subjective wellbeing - overall happiness, life satisfaction, self-esteem, or satisfactions with particular domains of life such as home, leisure, and work - is far too complex to reduce to factual representation. SWB statistics are useful, but they are facts about utterances and opinions, not hard facts about the real world. Quantitative research also plays key roles in fostering clear definitions of concepts, and analytical rigour in the development of causal theories. Still, the numbers only make sense in combination with a lot of qualitative analysis. To appreciate the distinct value of qualitative research, the first requirement is to recognize that it has purposes that tend to be very different from the purposes of statistical or experimental research. Qualitative scholarship tends to be more about ‘thinking or talking things through’ than about ‘finding things out’. Summarising qualitative research purposes, it has been argued that they aim ‘to describe and possibly explain events and experiences, but never to predict’ (Willig, 2013; p. 52). When we conduct qualitative research on complex aspects of wellbeing, the research purpose is not to accumulate and compare facts so as to prove or disprove hypotheses, but rather to enrich our conversations and our analytical tools so that we understand one another better and appreciate the diversity of human experiences. Qualitative research contributes to these objectives by strengthening our terminological sophistication, translating across diverse languages and cultures, providing analytical tools, proposing interesting questions and causal theories, and humanising the statistics by making them memorable and emotionally salient through real-life stories and vignettes. Research on wellbeing involves conceptualisation (what kinds of thing are we talking about when we discuss wellbeing? ); evaluation (how well do people live, and how and in what ways to they live well? ); correlation (what traits, activities, or events are linked with wellbeing? ); explanation (is it plausible or likely that those correlations may be causal?) and comparison (are people living better than before, better than other people, better in some respects than others, better than expected, etc.?). Apart from conceptualisation, which is purely a qualitative matter, all of these may involve a combination of quantitative and qualitative approaches. All are also ‘cultural’ insofar as there are strong cultural patterns, associated with social processes and institutions, that influences people’s attitudes and motivations concerning wellbeing. For example, in one cultural context wellbeing may mainly be conceived as meeting basic survival needs, and in another there may be more emphasis on existential meaning. Qualitative cultural research, as well as the informal cultural knowledge of researchers, provides crucial background analysis to contextualise all wellbeing research. Given the diversity of qualitative enquiry, it is useful to consider significant variations in its characteristics: the degree to which the approach is explicitly systematic or methodical; degree of emphasis on empirical evidence versus intellectual analysis; primary versus secondary evidence (i.e. whether or not data are by a researcher for specific research projects); study-specific versus research synthesis reports; armchair theorising versus laboratory research versus ‘naturalistic’ research in everyday life. Although most qualitative authors combine a variety of these characteristics, Table 1 offers a loose classification of books on happiness by qualitative scholars. Baumeister (1991); Vaillant (2002); Gough and McGregor (2007); Mischel (2014); Estes and Sirgy (2017). Scholarly or journalistic accounts based mainly on personal interviews and/or primary ethnographic research in naturalistic settings. case studies (getting into rich details of bounded examples of individuals, events, institutions, etc.). Since these traditions overlap and many scholars draw on several of them, it is probably more useful to consider broad-brushed differences between the cultural traditions of quantitative/positivistic and qualitative/interpretive scholarship, as indicated in Table 2. The most common and persuasive justification for qualitative wellbeing research is that it helps us recognize the many ways in which wellbeing concepts, experiences, and expressions are ‘culturally constructed’. Since we are all products of multiple cultural and social interactions, our sense of wellbeing must be understood not as a definable thing but as a complex web of negotiated and provisional meanings and values. No doubt most researchers working in ‘positivist’ and ‘quantitative’ traditions do recognize this, yet in practice their scientific discipline require a degree of control and reductionism that steers people towards ‘essentialism’ - imagining elusive entities such as happiness and cultural traits as if they were fixed things. Scientific aspirations can also steer people towards ‘universalism’ - imagining human psychology to be more unified than is actually the case. being culturally constructed rather than the result of a universal natural process, wellbeing concepts, valuations, experiences, and expressions are extremely varied worldwide, and between different institutions and situations within countries. every aspect of wellbeing is dynamic, changing according to different cultural situations and interactions. given the diversity and fluidity of ways in which people think and talk about wellbeing, no-one can have a totally secure sense of what wellbeing means to them or how happy they are. being products of specific cultural contexts and situations, wellbeing meanings and experiences are best appreciated in situ and are ultimately untranslatable. Since experiences are produced through interactions and narrations which usually involve other people and which built on cultural scripts, wellbeing is best understood as co-constructed and public, rather than pre-reflective and private. Thus, for example, if you ask someone about their happiness, the self-report isn’t just an expression of a pre-existing self-evaluation, but is in part a product of the question and of the social and physical environment in which it is asked. It is ‘elicited’ information rather than just a ‘given’ piece of data. Of all the personal and social goods that social researchers study, none seems to compare with happiness in terms of its uncontroversially universal value. Not even the most popular of other goods - such as economic growth, education, democracy, freedom, equality, or human rights - is universally valued. While there have been plenty of attempts to denigrate some specific forms or versions of happiness, such as selfish hedonism or idle contentment, it is hard to imagine a plausible sustained argument against the valuation of happiness in general. It is therefore common for popular texts on wellbeing to assert that everyone in the world wants to be happy and that all cultures value happiness. Both of these claims are true in a rather circular and therefore vacuous sense: insofar as ‘happiness’ means pursuing, getting, and enjoying whatever it is you want, then by definition happiness is wanted and valued. But the claims are also untrue in an important sense: since most people in the world don’t have English as their first language, it isn’t ‘happiness’ that they want and value, it’s bound to be a slightly different concept that they have their own labels for. And even in English, concepts and terms associated with ‘happiness’ are extremely diverse: fine, fun, flourishing, flow, fulfilment, etc., and that’s just the terms beginning with F. To assert that happiness is a cultural value really tells us little more than that value is valuable and that people prefer to live well. It doesn’t tell us whether people think of happiness as a personal or a collective thing; whether their concept includes afterlife bliss; whether it’s mainly about pursuits or achievements; whether people believe they have a soul whose happiness matters; whether they prefer excitement or quiet contentment; or whether progressive achievements are part of their idea of living well. It is hard to imagine a population lacking terminology for discussion wellbeing, but the ways people conduct such conversations may be instructive, For example, in Bolivia ‘there is no local term in Aymara for happiness’ but the goodness of life is discussed mainly in terms of either ‘Suma Jakaña’ (household wellbeing) or ‘Suma Qamaña’ (communal or national wellbeing) (Calestani, 2013). The terminology of wellbeing domains, too, varies widely by language and situation. What does ‘work’ mean, for example, for people who aren’t employed with regular hours at a separate workplace? What does ‘spirituality’ mean to an atheist? The language of comparison, too, is nuanced. For example the phrase ‘not too happy’ (commonly used in happiness surveys), depending on situations and cultural settings, may be taken literally or may be a form of ironic understatement meaning ‘slightly or very unhappy’. And ‘very happy’ may seem dignified and desirable to some, and undignified to others. So one of the key challenges for qualitative wellbeing research is to reveal and make sense of cultural diversities in the meanings, valuation, and practical implications of different terms and concepts relevant to the pursuit of happiness. Table 3 gives a structured overview of some of the key literature on these various aspects of the cultural inflection of wellbeing. Table 3: what aspects of wellbeing are culturally variable? Diversity, overt meanings, and nuances of the terminology used in talking and thinking about wellbeing. Wellbeing research is largely about evaluation - of selves, lives, situations, and cultural practices. For all humans, evaluative dispositions are developed through personal and situational perspectives, and through a variety of cultural values that are patterned by regional populations, social networks, religions, organizations, classes, age cohorts, and so on. Most research that is explicitly about ‘culture’ tends to reduce this versatile concept to broad-brushed generalisations about regional or national population. Much of the quantitative research on cultural values has focused on contrasts between regional values, particularly between ‘East’ and ‘West’, and/or between ‘communal’ and ‘individualistic’ cultures. But rather than being bound to nations or regions, most cultural phenomena are actually associated with other kinds of entity such as professions, activities, tools, built environments, corporations, schools, religions, age cohorts, social media, and social networks. Insofar as wellbeing is ‘cultural’, it is influenced through these cultural forces, not just through national traditions. Every human is therefore ‘multicultural’, and qualitative research is needed to reveal the rich variety of ways in which values and preferences are learned, chosen, experienced, and expressed through cultural media (Mathews, 2012; Knoop & Delle Fave, 2013; p. 1). Local ethnographic research helpfully explores these micro-level and situation-specific cultural influences with which every human being interacts. Culture influences every aspect of the pursuit of wellbeing, including: how wellbeing is conceived and discussed; norms and expectations concerning the experience and expression of wellbeing; perceived options for pathways to wellbeing; and the extent to which personal or collective wellbeing is emphasised, and the extent to which individuals are seen as responsible for their own wellbeing. Quantitative research both feeds off and promotes thinking about happiness and other phenomena in hydraulic and altitudinal metaphors (‘how much’? or ‘how full?’ or ‘how high’?). These metaphors apply not just to emotions and moods, but to ‘life satisfaction’ surveys which invite people to give a single rating to their ‘life as a whole’. Qualitative researchers are less interested in the quantity or altitude of happiness than in its splendid variety, messiness, elusiveness, and ultimate ineffability. Hence, they want to understand better the contexts in which people talk and think about happiness - how it is dynamically composed, displayed and recognized in everyday life. They ask ‘how’, ‘why’, ‘where’, ‘when’ and ‘with whom’ questions. And when they ask about lives as wholes, they are looking for holistic insights into how people integrate various domains and life phases, and how they balance self-orientation with self-transcendent concerns. It is important to appreciate not just how happy people are, but how wellbeing is composed. Just as we talk about the ‘compositional qualities’ of a picture or a piece of music, so too we can elucidate pursuits of happiness by discussing the compositional qualities of good lives. Commonly, people talk about these qualities, about the integration of various life domains, using metaphors of ‘balance’ or ‘harmony’ (Berzin, 1998; Bacon, 2009; Chen, 2009; Delle Fave, Massimini, & Bassi, 2011; p. 13; Ip, 2014; Kavedžija, 2015; Sundararajan, 2015). The expectation that good things such as positive emotions must be balanced by bad things, and that we should accept such contradictions, has been described as a ‘dialectical’ theme that is prominent in Chinese folk wisdom (Pen & Nisbett, 1999). But balance metaphors are probably a human cultural universal, reflecting their basis in the bodily experiences of the ongoing challenge of postural correction in response to challenges (Johnson, 1987; Kovecses, 2000). Biographical research on happiness in both USA (McAdams, 2005) and UK (Cieslik, 2015, 2016) shows that most people make ample reference to personal sacrifices and adversities when constructing narratives of the good life: what brings value and dignity is not the avoidance or denial of unhappiness, but coping well with troubles, sharing them through story-telling, and making sense of them. In some cultural traditions, most notably in parts of Asia influenced by Taoism and Confucianism, it has also been argued that people may value a sense of appropriate balance and moderation between pleasures and pains, rather than valuing or expecting a life of maximum pleasure or happiness (Tsai & Park, 2014). Consequently, people from cultures which value balance are likely to use ‘cultural scripts’ to ‘dampen’ their own experiences of positive emotion, as an emotion regulation strategy, in contrast to the ‘savoring’ of positive emotions commonly promoted in Western culture (Miyamoto & Ma, 2011). A more stark East-West contrast has also been observed in responses to negative emotion, with Asians much less likely to try to respond to adversity by deliberate positivity or denial (Miyamoto, Ma, & Petermann, 2014). Evidently, such contrasting beliefs are very likely to influence the scores people award themselves in self-reports on happiness or life satisfaction scales. The related but more complex metaphor of ‘harmony’ refers to interactions between components, rather than just to the proportionality. In a ‘harmonious’ life, or a ‘harmonious’ relationship or a ‘harmonious’ society, the different components complement each other in a pleasing or constructive way, as in the ‘harmony’ of a piece of music or a picture. Liang and Luo’s research in China revealed a discourse of ‘harmonious aging’, connected with the Yin-Yang philosophy, which contrasts with the western concept of ‘successful aging’. Often associated with ageism and with a quantitative evaluation of levels of activity, this western ideal can usefully be contrasted with the Chinese recognition of late-life wellbeing as a complex negotiation of changing motives and experiences as the body ages and as some social connections fall apart. A related metaphor of ‘conviviality’ emphasizes the cultural salience of harmony as a desirable social quality which may be deliberately cultivated, for example, by ritualised laughter as has been commonly observed for example in Amazonian and other Latin American populations (Overing & Passes, 2000; Calestani, 2013). Qualitative research has shown how balance and harmony metaphors act as important correctives against the implicit ‘more-is-better’ assumptions of quantitative evaluation, reminding of the possibly toxic outcomes of overzealously pursuing any one activity or good. In many cultures worldwide, harmony and balance metaphors also commonly allude to negotiations between care of the self and care of the community, and between personal and relational wellbeing (Mccubbin et al., 2013; Delle Fave et al., 2016; Arthur & Mair, 2017). Ultimately the purpose of most wellbeing research is to evaluate people’s whole lives. Conceptually, a ‘life’ may seem to be a natural phenomenon, but both lives and selves are in fact a cultural and negotiable phenomena, constantly being constructed and reconstructed through interactive story-telling. This universal practice provides us with crucial qualitative data that beg to be analysed. Biographies are not only stories about wellbeing (or illbeing), they also constitute wellbeing. One of the foremost qualitative psychology researchers is Jerome Bruner, who has made unique contributions to appreciation of the narrative construction and performance of personal identities (e.g., Bruner, 1984, 2003, 2008). Central to his work has been the idea that wellbeing is built up by culturally scripted forms of ‘intersubjectivity’ - that is, people enjoy their lives if they succeed in everyday life in telling one another stories that give them a comfortable sense of mutual appreciation - ‘being able to ''know'' and share each other's mental lives’, but also developing stories to enhance toleration of ‘deviations from shared ordinariness’ (Bruner, 2008; p. 35). The narrative dimension of social lives, therefore, involves an ongoing dynamic process balancing comfortable convention with individual creativity. In recent years, the leading exponent and promoter of biographical research on happiness has undoubtedly been Dan McAdams, whose work has largely been about the narrative development of personal identities and sense of self-worth in the USA. More clearly than anyone else, McAdams (2005) has demonstrated the intertwining of subjective wellbeing with cultural scripts that are interactively performed by telling stories that enable people to build up a sense of who they are that is publicly affirmed by listeners. Happiness, that is to say, is socially and culturally constructed through interactive self narratives. Adults who are exceptionally ‘generative’ in midlife use biographical stories not just to record their lives but to structure their lives and strengthen their motivation and sense of meaning. Such narratives have distinct culturally variable flavours: in the USA, a dominant theme is ‘redemption’ - triumphantly recovering from suffering and/or adversity to achieve a renewed and stronger self. This is important because it shows how even in one of the most ‘positive’, pro-happiness cultures in the world, substantial attention is paid to the critical roles of suffering and adversity in the good life. Also noteworthy is the substantial use that McAdams makes of secondary cultural and historical research in linking present-day self-narratives with historical figures, religious doctrine, and popular literature such as self-help texts. A similarly rich synthesis of autobiographical accounts and cultural history is provided by Gordon Mathews’ book What Makes Life Worth Living (1996), which was the first book-length ethnographic account of happiness. Mathews organized his innovative work around paired mini-biographies of USA and Japanese interviewees, and linked his interpretation of these with a full analysis of recent cultural and socio-economic trends in both countries. In contrast to many of the quantitative East-West psychological comparisons, Mathews offers a more subtle portrayal of cultural values which shows how there is plenty of evidence for both ‘individualism’ and ‘collectivism’ in both countries, with individuals working out their own unique ways of interacting with chosen cultural themes and values. An intriguing portrayal of narrative identity is presented in the folklorist-ethnographer Bénédicte Grima’s (1992) account of Paxtun women in Pakistan, who met regularly to compete with one another in miserabilist self-narratives. The ethic is the exact opposite of the north American ethic of compulsory positivity lambasted in Ehrenreich’s book Smile or Die [Bright-Sided]. For Paxtun women, dignity and respect come from turning events of extreme suffering into a story shared with other women. Like many activities, research can have both instrumental value and intrinsic value. Typically, scientific research is seen as a means to an end - producing new information in order to take better decisions. The emphasis is on the robustness of the findings rather than on the direct value of the research process itself. Qualitative research that is less detached, more participatory, and more blended with everyday public curiosities and conversations, is more likely to be recognized as having intrinsic or processual value. It can and arguably should make more direct contributions through the more immediate life enhancement that participation in research can provide. This is particularly true of qualitative enquiries on wellbeing, including one-to-one applied work such as life story elicitation and talk therapies, as well as focus group and organizational work that goes under the general label ‘appreciative enquiry’ (Prilleltensky & Prilleltensky, 2006.) Lewis outlines a set of principles of appreciative inquiry, which include promotion of a ‘constructionist’ recognition that we all create one another’s realities, and ‘positive’, ‘anticipatory’ and ‘narrative’ approaches that build and stories based on successes and enjoyments to foster constructive hope and motivation (2016; p. 126-7). The prospect of participatory research being directly beneficial is also particularly strong when working with categories of people who otherwise lack opportunities for reflection and public self-expression, such as children (e.g., Theron, Liebenberg, & Ungar, 2015; Nastasi & Borja, 2016; Fattore, Mason, & Watson, 2017), older people (Hoban, James, Pattrick, Beresford, & Fleming, 2011), and disadvantaged ethnic minorities (White & Jha, 2014). Provision of evidence about the benefits of appreciative enquiry tends to be impressionistic, anecdotal, and far from impartial. Both researchers and participants have a vested interest in demonstrating that they have been a force for good, and the research ethos of positivity points them in this direction (Bushe, 2007). One fairly typical example is Wendy Penney’s work in three residential care facilities in rural Victoria, Australia, which invited care staff to describe what they did well to improve residents’ lives. This is what is called the ‘unconditional positive question’ (Ludema, Cooperrider & Barrett, 2008). Researchers found that the process was enjoyable and energising for staff, that it resulted in more positive communication and sense of pride in work, and in potentially beneficial changes to everyday practices. A more sophisticated example is a comprehensive wellbeing enquiry and promotion programme in a USA school, involving a psychology interest group; parent training courses on wellbeing; a formal wellbeing curriculum; a wellbeing club including yoga, mindfulness and Tai Chi activities; and wellbeing courses. Researchers noted the enthusiastic adoption of these activities and were optimistic about benign impacts but were not able to offer evidence actual effects on objective or subjective wellbeing (Waters & White, 2015). There clearly is potential for qualitative researchers to improve the plausibility of their arguments by providing stronger and more impartial evaluative evidence of real-world changes brought about by participatory research. But we need to be realistic about the inevitable limitations of participatory research in this regard. And we mustn’t lose sight of the very plausible arguments about the direct benefits of fostering positive discussion of strengths and enjoyments in diverse social contexts. Bearing this in mind it can be argued, for example, that governments, corporations and civic organizations should support participatory wellbeing research even if there is great uncertainty about the validity and usefulness of its ultimate findings. A good society, and a good organization, is one which takes the wellbeing of its stakeholders seriously and encourages and enables them to voice their views on the matter. Of course, responsible researchers should make sincere efforts to produce valid and useful findings, but they should also cherish and enhance the values of the research process. Qualitative research approaches have much better potential in this regard. They can encourage active citizen participation in all aspects of the research process, whereas experimental and qualitative research tend to require alienating forms of expert control - even to the extent of hiding the true nature of enquiries. Since wellbeing themes are unavoidably evaluative, wellbeing researchers cannot escape the responsibility to move beyond moral relativism and try to help people make sense of evidence that reveals some cultural contexts and societies to perform much less well at facilitating wellbeing than others do (Thin, 2005; Mathews & Izquierdo, 2008b). Quantitative survey research has revealed very strong geographic patterns of self-reported happiness worldwide, unsurprisingly confirming that most people don’t seem very happy in those countries that inhibit freedom or that fail to meet basic needs for food, shelter, and physical security (Helliwell, Layard, & Sachs, 2017; Veenhoven, 2017). It has performed less well at exploring in detail the many forms of cultural toxicity that severely curtails people’s ability to live well in many parts of the world. Sociocultural anthropology, the archetypal qualitative research discipline, has a weak record in fostering explicitly evaluative cultural analysis. Like sociology, the discipline grew out of largely critical approaches to western modernity. Unlike sociology it focused on nonwestern cultures, and until the late 20th century it tended to foster two main principles: ‘relativism’ (insisting that cultures should be evaluated, if at all, only by their own criteria) and ‘adaptivism’ (assuming that cultural practices don’t survive if they are maladaptive, i.e. bad for survival). As an antidote to colonial triumphalism, many anthropologists have seen it as their moral duty to reveal the beauties and values of nonwestern culture and to avoid ‘ethnocentric’ use of alien values to criticise aspects of culture. And the ‘adaptivist’ principle is nonevaluative too, insofar as it is about mere survival, not about wellbeing. Hence the discipline has failed to develop either theories of human flourishing or any sustained analysis or critiques of cultural harms. The psychological anthropologist Robert Edgerton did produce an impressive collection of crosscultural evidence of cultural harms around the world. In his book Sick Societies (1992) presents a catalogue of social ills. He notes that most human cultures have allowed practices to persist which promote physical and mental illness, poverty, unfair inequalities, avoidable suffering, and premature death. The forms of toxic culture which anthropologists have habitually failed to criticise include: warfare; witchcraft; ‘honour’ killings; torture and severe corporal punishments and humiliations; dowry harassment; human sacrifice; ritualised and sanctified sexual abuse of children; genital mutilation of children and other harmful bodily mutilations; male dominance; dangerous health practices; poor nutrition; widow-burning; and blood feuds. Although Edgerton’s moral call to arms failed to ignite a new evaluative tradition in anthropology, since the 1970s anthropologists have in general shifted their interests towards researching mainly pathologies much as sociologists have always done. Sociologists, unlike anthropologists, were throughout the 20th century mainly interested in social harms but in a highly restrictive way: for the most part, their critical attention was directed towards western modernity, and by extension towards the metropolitan urban cultures of poorer countries. This kind of bias is flagrant, for example, in a recent sociological text entitled Social Harm (Pemberton, 2015), which directs its critical gaze only at those harms that the author believes can be attributed to ‘neoliberal’ modernity. A different but analogous kind of bias is evident in a feminist collection on Harmful Cultural Practices around the world (Longman & Bradley, 2016), which similarly sounds global in scope but is actually a collection of essays by women scholars who define ‘cultural harm’ solely in terms of the harms done to female victims. From both an evaluative and a policy perspective, qualitative scholarship on cultural harms would be greatly enhanced if scholars took seriously their responsibility to consider the wellbeing of humanity in general in less partisan ways. In contrast to wellbeing scholars, who are quite happy to generalise, it seems that scholars specialising in the study of harm feel a need to indulge in dichotomous portrayals of victims and perpetrators. Apart from the problem of selective bias in criticism of cultural and social harms, qualitative research disciplines have also in general reduced their descriptive validity, their moral plausibility, and their ability to achieve benign influence on the world, by failing to theorise or define the opposite of harms and harmfulness, i.e. wellbeing and beneficence. There are innumerable ethnographic monographs on various forms of suffering and injustice, but even apparently neutral or balanced texts such as Subjectivity: Ethnographic Investigations (Biehl, Good, & Kleinman, 2007) or Contentment and Suffering (Hollan & Wellenkamp, 1994) or Wellbeing in the Time of AIDS (Wallman, 1996) or World Mental Health (Desjarlais Eisenberg, Good, & Kleinman, 1995) have shown relentless interest in adversities without any complementary ethnography or theorising of wellbeing. With the rapid proliferation of all kinds of wellbeing research output from an increasing variety of disciplines and countries, the need for persuasive and reliable synthesis research becomes paramount. This is also important as a way of addressing the collective weakness of much qualitative research that remains a somewhat ad hoc collection of one-off local studies based on small samples and idiosyncratic methods. Good synthesis research is needed to move towards viable generalisations and crosscultural comparisons. The messiness and flexibility of idiosyncratic approaches makes it hard to discern the validity and quality of specific studies. The vagueness and uncertainty of research purposes, questions, and findings, and in some cases even a total lack of ‘findings,’ means that much qualitative research is at best suggestive rather than conclusive. If ‘pluralism’ is the key benefit that qualitative approaches add to wellbeing research (Gergen, Josselson, & Freeman, 2015), those who try to help us make sense of this plurality must provide some guidance regarding the comparative values of diverse methods. But whereas with quantitative research there are clear and strict protocols for conducting and presenting ‘meta-analysis,’ qualitative researchers have yet to come up with clear guidelines for synthesis, and secondary research analysis is in practice mainly conducted without any clear system. Although improvements in transparent reporting of approaches and rationales in qualitative synthesis research are possible and desirable, realistically the process is too unwieldy to expect more than a loose set of explanations and justifications. Tight specification of inclusion and exclusion criteria would result in too much loss of flexibility, steering attention towards a narrow subset of those varieties of qualitative writing most amenable to comparison and synthesis. ‘Secondary’ research methods means using information that was generated for different purposes - whether for personal or bureaucratic record, or for other research purposes. When numerous quantitative studies are synthesised, this is called a ‘meta-analysis’ or ‘synthesis’. But such research is dependent on finding several studies that match rigorous inclusion criteria so that they are properly comparable. When qualitative research is synthesised, scientifically valid generalisations aren’t possible. But this doesn’t prevent the formation of useful insights based on high levels of plausibility as opposed to scientific near-certainty. Most qualitative synthesis takes the form of relatively ad hoc literature reviews (e.g. in the opening paragraphs of articles or books) or introductions to thematic collections which both synthesis crosscutting themes in the collection and link these with other literature. As published information proliferates, and as the boundary between one-off scholarly research and ongoing public learning becomes blurred, future qualitative research scholars can greatly add to the value of qualitative research by coming up with approaches to research synthesis that are reasonably systematic and transparent, but without resorting to the excessively restrictive and exclusionary approaches that dominate ‘meta-analysis’ in quantitative science. We have reviewed here a small fraction of the increasingly copious qualitative research output on wellbeing from anthropology, sociology, psychology, linguistics, history, development studies, literary studies, human geography, political science, cultural studies, and philosophy. Most of these disciplines have not made wellbeing as central or as explicit in their research agendas as they should have done, and many have been either ethnocentric or somewhat culture-blind in their approaches. Though there encouraging signs of rapidly increasing quantity and diversity of crosscultural wellbeing research but there is a long way to go in terms of clarifying methods for conducting, synergising and synthesising this research (Tonon, 2015; Bruni & Porta, 2016). All researchers need to take culture seriously as the environment in which wellbeing develops. To do this, we must pay systematic attention to language, learning, scripting, sharing and interactive display and discussion of wellbeing. For ‘subjective’ wellbeing, i.e. happiness, this means exploring subjective experience in its full complexity, looking well beyond not only the individual’s self-reports or laboratory behaviors to examining the dialectic interactions of everyday life. But addressing these important complexities in the qualitative dimensions of wellbeing research comes at a high price. Qualitative research is in general slow, scrappy, extremely diverse in its disciplines and methods. Its outputs come nowhere near the clarity and confidence that we see in the outputs from the tactically reductionist research of experimental science and survey-based quantification. Collectively, the persuasions and influences of qualitative research are achieved - if at all - indirectly rather than through provision of clear conclusions from specific studies or research syntheses. For funders and users of research on wellbeing, or for researchers trying to striking an optimal balance between qualitative and quantitative aspects of their work, this creates difficult strategic decisions. Some themes and questions - generally specific ones about particular kinds of behavior or correlation - can be effectively answered by experimental or quantitative research. All of the most important questions, however, require input from qualitative approaches. Decisions about research methods take place at multiple levels, from the pico-level of specific topics and activities, through the micro-level of individual researchers and projects, the meso-levels of programmes, institutions, and research areas, to the macro-levels of whole academic disciplines and national or corporate research strategies. All we can ask is that all researchers give respectful and intelligent consideration to judicious mixing of methods and approaches. Adelson, N. (2000). Being alive well: Health and the politics of cree well-being. Toronto: University of Toronto Press. Allport, G. (1942). The use of personal documents in psychological science. New York: Social Sciences Research Council. Altarriba, J., Basnight, D. M., & Canary, T. M. (2003). Emotion representation and perception across cultures. In W. J. Lonner, D. L. Dinnel, S. A. Hayes, & D. N. Sattler (Eds. ), Online readings in psychology and culture. Arthur, S., & Mair, V. (2017) East Asian historical traditions of well-being. In R.J. Estes and M.J. Sirgy (Eds. ), The pursuit of human well-being (pp. 59-82). Dordrecht: Springer. Bacon, S. F. (2009). Balance. In S.J. Lopez (Ed. ), Encyclopedia of positive psychology (pp. 94-98). Chichester, UK: Wiley-Blackwell. Badhwar, N. K. (2014). Well-being: Happiness in a worthwhile life. Oxford: Oxford University Press. Baumeister , R. F. (1991). Meanings of life. New York: Guilford Press. Baylis, N. (2006). Learning from wonderful lives: Lessons from the study of well-being. Cambridge: Well-being Books. Berzin, A. (1998). Developing balanced sensitivity: Practical Buddhist exercises for daily life. Ithaca, NY: Snow Lion. Biehl, J., Good, B., & Kleinman, A. (Eds.) (2007). Subjectivity: Ethnographic investigations. Berkeley: University of California Press. Bok, D., (2010). The politics of happiness: What government can learn from the new research on well-being. Princeton, NJ: Princeton University Press. Bok, S. (2010). Exploring happiness: From Aristotle to brain science. Yale University Press. Boster, J. S. (2017). Emotion categories across languages. In H. Cohen and C. Lefebvre (Eds. ), Handbook of categorization in cognitive science, 2nd ed. (pp.313-352). Amsterdam: Elsevier. Bruner, E. M. (ed) (1984) Text, play and story: The construction and reconstruction of self and society. Washington, D.C.: American Ethnological Society. Bruner, J. (2003). Self-making narratives. In R. Fivush and C.A. Haden (Eds. ), Autobiographical memory and the construction of a narrative self: Developmental and cultural perspectives (pp.209-226) Mahwah, NJ: Lawrence Erlbaum. Bruni, L., & Porta, P. L. (Eds.) (2016). Handbook of research methods and applications in happiness and quality of life. Chichester, UK: Elgar. Calestani, M. (2013). An anthropological journey into well-being: Insights from Bolivia. Dordrecht: Springer. Camic, P. M., Rhodes, J. E. Yardley, L., & Bamberg, M. (Eds.) (2003). Qualitative research in psychology: Expanding perspectives in methodology and design. Washington, DC: American Psychological Association. Chen, S. X. (2009). Harmony. In S.J. Lopez (Ed. ), Encyclopedia of positive psychology (pp.464-467) Chichester, UK: Wiley-Blackwell. Cieslik, M. (2016). The happiness riddle and the quest for a good life. Houndmills, UK: Palgrave Macmillan. Creswell, J. W. (1998/2017). Qualitative inquiry and research design: Choosing among five traditions. (4th ed). London: Sage. Creswell, J. W. (2002/2009). Research design: Qualitative, quantitative, and mixed methods approaches (3rd Ed). London: Sage. Csikszentmihalyi, M. (1992\2002). Flow: The psychology of happiness. London: Rider. Delle Fave, A. (2013). Past, present, and future of flow. In S. David, I. Boniwell, and A.C. Ayers (Eds. ), Oxford handbook of happiness (pp. 60-7) Oxford: Oxford University Press. Delle Fave, A. et al (2016). Lay definitions of happiness across nations: The primacy of inner harmony and relational connectedness. Frontiers in Psychology, 7, 1-30. Delle Fave, A., Massimini, F. & Bassi, M. (2011). Psychological selection and optimal experience across cultures. Dordrecht: Springer. Desjarlais R., Eisenberg L., Good, B., & Kleinman, A. (Eds.) (1995). World mental health: Problems and priorities in low-income countries. New York: Oxford University Press. Edgerton, R. (1992). Sick societies: Challenging the myth of primitive harmony. New York: Free Press. Ehrenreich, B. (2009). Smile or die [bright-sided]: How positive thinking fooled America and the world. London: Granta. Estes, R. J., and Sirgy, M. J. (Eds.) (2017). The pursuit of human well-being: The untold global history. Dordrecht: Springer. Fattore, T., Mason, J., & Watson, E. (2017). Children’s understandings of well-being: Towards a child standpoint. Dordrecht: Springer. Fischer, E. F. (2014). The good life: Aspiration, dignity, and the anthropology of wellbeing. Stanford, NJ: Stanford University Press. Goddard, C., & Wierzbicka, A. (2013). Words and meanings: Lexical semantics across domains, languages, and cultures. Oxford: Oxford University Press. Goertz, G., & Mahoney, J. (2012). A tale of two cultures: Qualitative and quantitative research in the social sciences. Princeton: Princeton University Press. Gough, I., & McGregor, J. A. (Eds.) (2007). Wellbeing in developing countries: From theory to research. Cambridge: Cambridge University Press. Grima, B. (1992). The performance of emotion among Paxtun women. Austin, TX: University of Texas Press. Haidt, J. (2006). Happiness hypothesis: Finding modern truth in ancient wisdom. New York: Basic Books. Haybron, D. (2008). The pursuit of unhappiness: The elusive psychology of well-being. Oxford: Oxford University Press. Hefferon, K., & Boniwell, I. (2011). Positive psychology: Theory, research and applications. Maidenhead, UK: Open University Press. Helliwell, J., Layard, R., & Sachs, J. (Eds.) (2017). World happiness report 2017. New York: UN Sustainable Development Solutions Network (SDSN). Hollan, D. W. (1992). Emotion work and the value of emotional equanimity among the Toraja. Ethnology, 31, 45-56. doi: 0.2307/3773441. Hollan, D. W., and Wellenkamp, J.C. (1994). Contentment and suffering: Culture and experience in Toraja. New York: Columbia University Press. Hyman, L. (2014). Happiness: Understandings, narratives and discourses. Houndmills, UK: Palgrave Macmillan. Järviluoma, H., Moisala, P., & Vilkko, A. (2004). Gender and qualitative methods. London: Sage. Johnson, M. (1987). The body in the mind: The bodily basis of meaning, imagination, and reason. Chicago, IL: University of Chicago Press. Johnson, M. (2013). Evaluating culture: Wellbeing, institutions and circumstance. Houndmills, UK: Palgrave Macmillan. Kavedžija, I., & Walker, H. (Eds.) (2017). Values of happiness: Toward an anthropology of purpose in life. Hau Books/University of Chicago Press. Knoop, H. H., & Delle Fave, A. (Eds.) (2013). Well-being and cultures: Perspectives from positive psychology. Dordrecht: Springer. Kosaka, K. (Ed.) (2006). A sociology of happiness: Japanese perspectives. Melbourne: Trans Paciﬁc Press. Kovecses, Z. (2000). Metaphor and emotion: Language, culture, and body in human feeling. Cambridge: Cambridge University Press. Lewis, S. (2016). Positive psychology and change: How leadership, collaboration, and appreciative inquiry create transformational results. Hoboken, NJ: Wiley. Longman, C., & Bradley, T. (Eds.) (2016). Interrogating harmful cultural practices: Gender, culture and coercion. Abingdon, UK: Ashgate. Low, S. M. (2004). Behind the gates: Life, security, and the pursuit of happiness in fortress America. London: Routledge. Ludema, J., Cooperrider, D., & Barrett, F. (2008). Appreciative Inquiry: The power of the unconditional positive question. In P. Reason and H. Bradbury (Eds. ), Handbook of action research, 2nd ed. London: Sage. Martin, M. W. (2012). Happiness and the good life. Oxford: Oxford University Press. Mathews, G. (1996). What makes life worth living? How Japanese and Americans make sense of their worlds. Berkeley, CA: University of California Press. Mathews, G., & Izquierdo, C. (2008a). Introduction: Anthropology, happiness, and well-being. In G. Mathews & C. Izquierdo (Eds. ), Pursuits of happiness: Well-being in anthropological perspective (pp. 1-22) Oxford: Berg. Mathews, G., & Izquierdo, C. (2008b). Conclusion: Towards an anthropology of well-being. In G. Mathews & C. Izquierdo (Eds. ), Pursuits of happiness: Well-being in anthropological perspective (pp. 248-260) Oxford: Berg. McAdams, D. P. (2005). The redemptive self: Stories Americans live by. New York: Oxford University Press. Mccubbin, L. D., Mccubbin, H. I., Zhang, W., Kehl, L., & Strom, I. (2013). Relational well-being: An indigenous perspective and measure. Family Relations, 62(2), 354-363. McKenzie, J. (2016). Deconstructing happiness: Critical sociology and the good life. London: Routledge. McMahon, D. M. (2006). Happiness: A history. Atlantic Monthly Press. Mischel, W. (2014). The Marshmallow Test: Understanding self-control and how to master it. New York: Little, Brown & Co.
Nastasi, B. K., & Borja, A. P. (Eds.) (2016). International handbook of psychological well-being in children and adolescents. Cham: Springer. Oakley, A. (2000). Experiments in knowing: Gender and method in the social sciences. Cambridge: Polity Press. Ogarkova, A. (2016). Translatability of emotions. In H.L. Meiselman, (Ed. ), Emotion neasurement (pp. 575-59) Amsterdam: Elsevier. Overing, J., & Passes, A. (Eds.) (2000). The anthropology of love and anger: The aesthetics of conviviality in native Amazonia. London: Routledge. Pawelski, J. O., & Moores, D. J. (2013). The eudaimonic turn: Well-being in literary studies. Lanham: Fairleigh Dickinson University Press. Pemberton, S. A. (2015). Harmful societies: Understanding social harm. Bristol: Policy Press. Peng, K., & Nisbett, R. E. (1999). Culture, dialectics, and reasoning about contradiction. American Psychologist, 54(9), 741–7542. Prilleltensky, I., & Prilleltensky, O. (2006). Promoting well-being: Linking personal, organizational, and community change. Chichester, UK: Wiley. Reddy, W. (2001). The navigation of feeling: A framework for the history of emotions. Cambridge: Cambridge University Press. Salzman, P. C. (2010). Methodology. In A. Barnard and J.Spencer (Eds. ), Encyclopedia of social and cultural anthropology, 2nd Edn (pp. 462-266). London: Routledge. Snell-Rood, C. (2015). No one will let her live: Women’s struggle for well-being in a Delhi slum. Oakland: University of California Press. Stearns, C. Z., & Stearns, P. N. (Eds.) (1988). Emotion and social change: Toward a new psychohistory. Holmes & Meier. Stebbins, R. A. (2011). Personal decisions in the public square: Beyond problem solving into a positive sociology. Transaction Publishers. Steedman, I., Atherton, J.R., and Graham, E. (Eds.) (2010). The practices of happiness: Political economy, religion and wellbeing. London: Routledge. Sternberg, R. J. (1999). Love is a story: A new theory of relationships. New York: Oxford University Press. Sundararajan, L. (2015). Understanding emotion in Chinese culture: Thinking through psychology. Dordrecht: Springer. Susen, S. (2015) The postmodern turn in the social sciences. Houndmills, UK: Palgrave Macmillan. Theron, L. C., Liebenberg, L., & Ungar, M. (Eds.) (2015). Youth resilience and culture: Commonalities and complexities. Dordrecht: Springer. Thin, N. (2012). Social happiness: Research into policy and practice. Bristol: Policy Press. Thin, N. (2018). Quality of life issues in development. In H.Callan (Ed. ), International encyclopedia of anthropology. Chichester, UK: Wiley-Blackwell. Thomas, K. (2009). The ends of life: Roads to fulfillment in early modern England. Oxford: Oxford University Press. Tiberius, V. (2008). The reflective life: Living wisely with our limits. Oxford: Oxford University Press. Tonon, G. (Ed.) (2015). Qualitative studies in quality of life. Dordrecht: Springer. Tsai, J., & Park, B. (2014). The cultural shaping of happiness the role of ideal affect. In J. Gruber and J.T. Moskowitz (Eds. ), Positive emotion. Oxford: Oxford University Press. Tuan, Y-F. (1986). The good life. Madison, WI: University of Wisconsin Press. Vaillant, G. E. (2002). Ageing well: Surprising guideposts to a happier life from the landmark Harvard Study of Adult Development. Melbourne: Scribe. Veenhoven, R. (2006). Unseen happiness: Why sociologists fail to acknowledge findings on this matter. Presentation at the 16th World Congress of Sociology Working Group 06 Social Indicators, Durban, South Africa, 23-29 July. Wallman, S., & Bantebya-Kyomuendo, G. (1996). Kampala women getting by: Wellbeing in the time of AIDS. London: James Currey. Watkins, & Shulman, H. (2008). Toward psychologies of liberation. London: Palgrave Macmillan. Weiner, E. (2008). The geography of bliss: One grump’s search for the happiest places in the world. London: Transworld. Wikan, U. (1990). Managing turbulent hearts: a Balinese formula for living. Chicago: University of Chicago Press. Willig, C. (2013). Introducing qualitative research in psychology. 3rd edition. Maidenhead, UK: Open University Press.